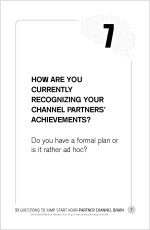 How are you recognizing Channel Partner achievements? Home → Uncategorized → How are you recognizing Channel Partner achievements? Do birds of a feather prefer to flock together? Or do opposites attract? I’m going to save you a lot of time debating this. When it comes to Channel Partner recognition, go with the “Birds of the Feather” approach. Here’s why. In Question 6 we talked about recognizing the individual accomplishments of top performing Channel Partner sales reps. Today’s question is about recognizing the achievements of your Channel Partners as organizations. This means, acknowledging Widgets Partners, Inc. of North Platte and not Jim Fletcher, their top sales rep.
For many, the first thing that comes to mind when it comes to the subject of recognizing Channel Partner achievements is wall plaques (see: examples). Certainly better than doing nothing at all, wall plaques have become little more than expected nice-to-haves with the wow factor of getting socks for Christmas. As Mark Repkin pointed out in our interview (see: Question 6—Partner Channel Motivation), recognition must create lasting memories that link the award to the achievement. This is true for individuals as well as for the Channel Partner, at the organization-level. Where individual recognition works best when the “winner” has a choice of award options, that may not work well in your Channel Partner program if your goal is to uniformly recognize Partners as they reach different levels (e.g., Gold, Platinum Partners). 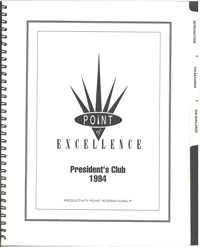 In 1993 I joined Productivity Point International, a franchisor of computer training centers across the US and Canada. Before joining PPI, our franchise owners (i.e., our Channel Partners) had their own independent training firms. By joining us and converting to our system, they could sell and fulfill corporate training contracts to the Fortune500®. We also had an outstanding library of training curriculum. But change was really painful for them. They were slow to adopt our standards, especially when it came to local marketing. As our base of corporate accounts grew, the lack of uniformity was becoming an issue for our sales teams. Customers were wondering if our delivery system was actually one entity or a contract network. At a franchise owners meeting later that year I decided to make my case using a visual aid. I had my marketing team create a mural of training schedules from each of our franchises. It looked like a giant patchwork quilt. The reaction was predicable. With the threat of losing our natural edge at winning corporate-wide training contracts, the franchise owners asked for action—even if it meant big changes (changes they had already contractually agreed to in their franchise contracts, but failed to implement). 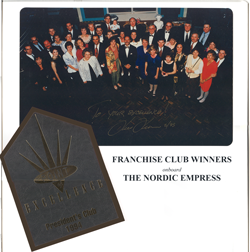 All franchises meeting these requirements would join us on a Four Day Bahamas Cruise on-board the Royal Caribbean Cruise Line’s Nordic Empress. The entire program cost was justified based solely on the increase in revenue stipulated in the program rules. About three-fourths of our members joined us on the trip. Remember my opening question about birds of a feather. Well as it turns out, the biggest incentive, the overriding motivation for the owners to win wasn’t the trip. And it wasn’t the benefit of system-wide uniformity. The driver was the opportunity for top-performing franchise owners to spend four days, at our expense, to hang around with other top-performers. To swap ideas. Network. And talk about winning new, big, corporate training contracts. Just a few things wall plaques can’t do.